Unless you think a healthy combination of Willie Roaf, Brian Waters and Will Shields are coming to Miami with him, this projection is far too optimistic. I don't think you can just discount 20006 as if it did not happen, and go back to full seasons, given this QB's age. That's an excellent point. Green's mobility is the biggest concern, I agree. He is on the decline, but he still can be accurate. By the way, I did include his 2006 performance, and weighted it as a full season. Miami actually did a decent job of protecting their quarterbacks last year, so the projection may not be too optimistic. My real point is how much QB accuracy impacts an offense and therefore wins. Green will probably be a big upgrade in completion percentage and interception rate for the Dolphins. And that translates into wins over the season. I guess I'll be doing a "Harrington in Atlanta" projection next. 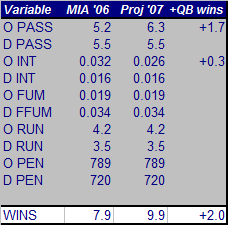 Even if you cut the added wins projection in half, Miami underperformed their statistical efficiency by 1 or 2 wins. Given that Cameron is at least an average coach (neither adds to nor subtracts from his team), I don't think it'd be terribly unreasonable to expect a 10-6 team. The offensive line is improving under Houck. Culpepper was largely immobilized from the knee injuries and likely contributed significantly to his own sack numbers. He was sacked 21 times on 155 attempts. Under Harrington, the Dolphins gave up 15 sacks on 403 pass plays. That's a pretty dang low sack rate. Houck retooled the line several times during the season as well, but with some added depth to the line, hopefully everything will settle into place. Cameron has retooled the offense in order to get some big play ability. I think it's difficult to predict exactly how the Dolphins offense will turn out because the previous coaching regimes haven't demanded more than a few big passing plays the last several years. There are simply a lot of unknowns at this point. Wow. 14 sacks on 403 plays. That's amazing. It also goes to show how much the QB has to do with sacks. I saw the same thing when McNair took over for Boller. Boller would walk right into a sack while McNair could step up in the pocket. The Ravens went from one of the worst stats on pass protection to the best from '05 to '06.